This illustrates the variety of suits available in 1906. 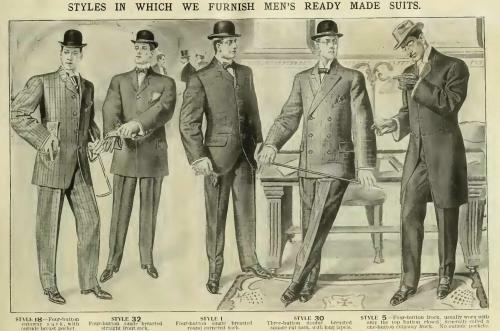 Note the double breasted suit - a style one tends to associate with the 1920s and 30s. The man on the right is quite interesting. The label says it is a frock suit with no outside pockets, and generally with only the top button buttoned. It seems a bit fashion-forward that he is wearing a frock with a Hamborg and not a top hat. I have yet to see a photograph of such a combination, and would generally expect to see such a hat worn with a sack suit.